Six disturbing new chapters in the Left 4 Dead Series await you, time to team up and reload! Back to School is a new and challenging Left 4 Dead and Left 4 Dead 2 campaign available now and set against the backdrop of Borden city. Our four protagonists have heard that the US Military are planning to come in and clean up the city from the infection and have decided to go the the nearest stronghold, which just happens to be the local high school. The team start out from the north while the army starts from the south, in order to get to the high school they must fight their way through five additional brand new areas: The Forest; The Railway Station; The Town; The Cinema; and The Church, before finally arriving at the gates of the high school. Even though you have all these new locations it will still feel familiar, dark and menacing backdrops, zombies coming at you left, right and center and the all important team chatter. 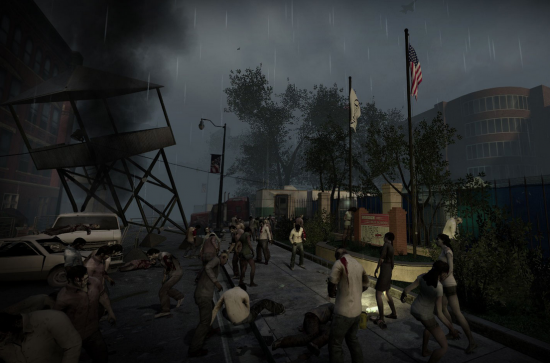 Although the Back to School campaign was originally released for download on 28 October 2012, there were a few technical glitches which meant that it wasn’t ideal gameplay, in fact all the features of the new campaign weren’t actually in place. But with the latest release it looks like everything is finally in place and it’s a good time to download the campaign and give it a try. Be warned, I have read that the difficulty settings for the new campaign don’t entirely mesh with those of the base game, so just keep that in mind when you are turning the settings up to expert, this campaign is hard. For more information visit the official campaign site or check out the L4D Back to School group on Steam, you’ll also find the back to school forum on Steam here: steamcommunity.com/groups/backtoschool/discussions. Excellent post. Keep writing such kind oof inffo on your blog. I still can’t believe how much free content has been added to this game over the past several years. I think they’ve added more single player content for free (PC USERS) then was available when the game was released.